Keep on Rowland: Patience is a virtue. As true and biblical as it is, I have heard this cliche phrase hundreds of times over the course of my life. The actual word "virture" means "behavior showing high moral standards." Therefore, being patient would equate to exhibiting high moral standards. Not that I don't have high moral standards, but patience is certainly not my area to shine. I confess, I have an A type personality. "A place for everything and everything in its place" was written for me. I am a list lady. I am a clean freak. I notice when someone moves a pillow on my couch or borrows a pencil from my work desk. Maybe this makes me crazy and I certainly would not have an argument otherwise, but this is the how I was created. Trying to find a balance is a struggle, but I work at it every day. I recognize my lack of patience on a daily basis. I struggle every day to choose kind words instead of negative words, to see that the world is a friendly place and not a an attacking place. As silly as it sounds, I feel like sometimes God makes a little game out of my lack of patience. The past couple of weeks have been extra trying because of a new work situation. To no ones fault of my own, I have left irritated and on edge many days. The last few months have been trying as well, while balancing a busy work schedule and renovating a house. Often times, things have not gone my way, budgets have not stayed in tact, timing has not been perfect..After evaluating myself and my struggle with this, it has really opened my eyes to find out that the common denominator here is me. I am the one who is irritated because things don't go perfectly. I am the one stressed while being away from the office for a vacation day and feeling impending doom that everything is going to fall apart. I am the one who can not seem to learn to delegate and let tasks go: trusting that the assignee will do well. I am the one stressing over the paint colors being perfect and the pillows being in place. Hi, my name is Anna Rowland and I am an impatient, paranoid control freak. And it is completely exhausting. Waking up in the middle of the night worried if I completed a task on a file I am working. Worrying so much about pleasing every person in my life when in actuality, this could never really happen. All of these things: Exhausting. Consuming my time and talents and giving me too many grey hairs. What can wash this away? Remove these minor stresses that won't amount to anything in the grand scheme of things? Change my job? Hire a personal maid? Get a heavy dose of medication? The answer is simple. I have to change me. I have to change my outlook and my heart. I can not control the acts or hearts of anyone but myself. My goal for this year is to get a handle on my control-freakness <<-- is that a word? I just made it one. I want to find peace in this maddness I call my life. I want to find balance. Last week I ordered a necklace from a random retailer that I had never purchased from before. The necklace came in today and with it was a small card about the size of a business card. The words on the business card made me giggle. The words on it were so true to heart and to my life right now that it was almost scary. The card said " Never let success get to your head. 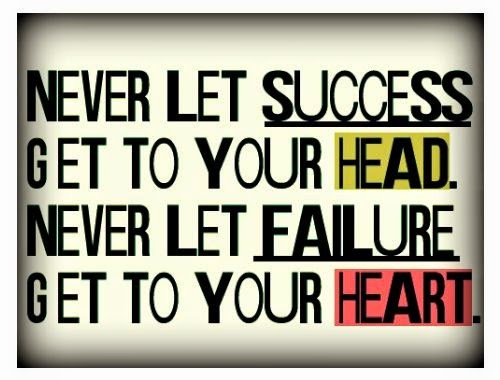 Never let failure get to your heart." I don't believe in conisidence. I needed the words on this card today.